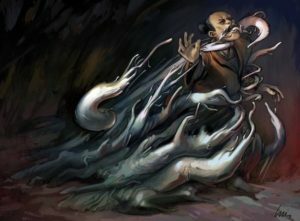 This formless mass of flesh can tear small animals apart with its tentacles and consume an adult human in less than a day. But that is not why it is feared. Most adventurers assume this is just a normal ooze. But the Ooz emits a magical, sonic aura that creates a deathly silence all around it. Spells that rely on vocal components fail. Allies cannot coordinate their attacks. 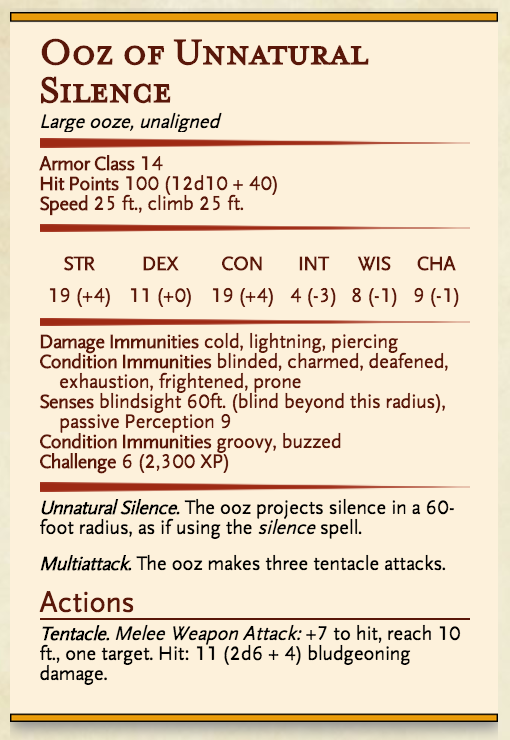 The Ooz prefers to lair in relatively small spaces, so that enemies with magical powers cannot escape its aura of silence. Some say that each Ooz is the remains of a spellcaster who specialized in aural research, and that a captured Ooz can sometimes be made to communicate with its captors. > – **Speed** 25 ft., climb 25 ft.
> ***Unnatural Silence. *** The ooz projects silence in a 60-foot radius, as if using the *silence* spell. > ***Multiattack. *** The ooz makes three tentacle attacks. > ***Tentacle. *** *Melee Weapon Attack:* +7 to hit, reach 10 ft., one target. Hit: 11 (2d6 + 4) bludgeoning damage.